Baseball player Alex Rodriguez appears to have an unusual business counselor: SAC Capital Advisors founder Steve Cohen. The two had drinks Sunday night at The Peninsula hotel bar in Beverly Hills, California, on the eve of their attendance at the Milken Institute Global Conference, according to people with direct knowledge of the meeting. The pair were part of a group of about eight at the upscale Los Angeles-area venue. It's not clear who the other attendees were or what specifically was discussed. A spokesman for Point72 Asset Management—the name of Cohen's new personal investment group after SAC's criminal guilty plea on insider trading-related charges—declined to comment. Rodriguez also declined to comment when approached at the Milken event; an external spokesman also wouldn't comment. Rodriguez was spotted at various Milken events over the following days. On Tuesday, he went to a reception celebrating women business leaders hosted by Pattie Sellers of Fortune. On Wednesday, he attended a panel discussion on the business of sports with former basketball player-turned-entrepreneur Magic Johnson and football star Larry Fitzgerald. Like the baseball star, Cohen attended the business-heavy event but was not listed as a speaker. Rodriguez was more visible, taking photos with several fans that were posted on Twitter. Rodriguez is currently suspended from playing for the New York Yankees by Major League Baseball for 162 games because of a doping investigation. While the slugger's contract goes through 2017, the 38-year-old appears to be thinking about life after baseball by attending elite business conferences. According to people familiar with his plans, Rodriguez also intends to travel to the Berkshire Hathaway annual shareholder meeting held by billionaire investor Warren Buffett in Omaha, Nebraska, this weekend. A 2013 New York magazine profile of Rodriguez describes him as a "cautious, deliberate businessman" who earns as much as $20 million a year from nonbaseball sources such as "gyms, car dealerships, low-end real estate." 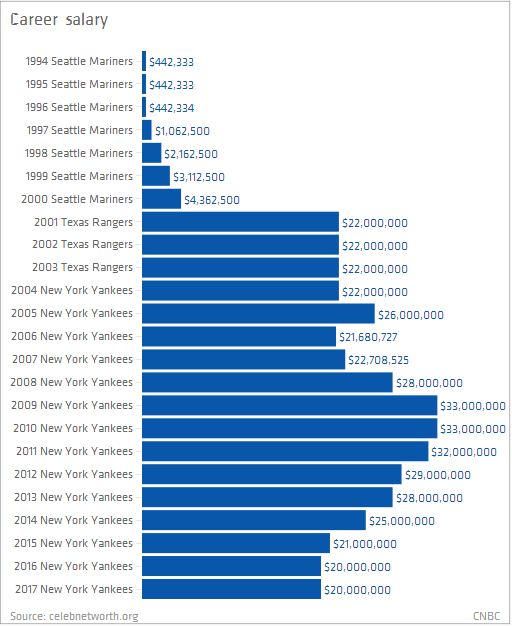 Indeed, Rodriguez has a lot to invest: His 10-year contract in 2007 was worth a total of $275 million.